Fabric: Cotton, organic cotton, jacquard, cotton twill, cotton drill. 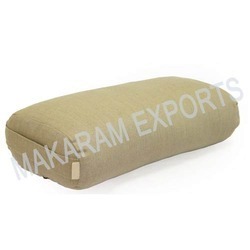 To cater the variegated demands of our clients, we are highly engrossed in trading a qualitative range of Cushion Bolster. Bolster helps open chest, extend spine, stretch thighs.Bolsters are filled with natural cotton batting. Firm and dense structure of the bolster provides perfect support in many Yoga postures.Bolsters provide reliable, effective support even when you place yourself in difficult position. Bolsters are great for stretching and supporting the belly, back, hamstring & chest. We manufacture and supply high quality Foam Bolsters, which are made from premium foam covered with a fine cotton fabric. These are available in stylish designs and vibrant colors and add that touch of class while adorning sofa sets, beds and other furniture. Our range of pillow inserts, cushion inserts, bolsters are available in different sizes and is vacuum packed as per customer requirement. We use very high quality polyfibre for filling these products. 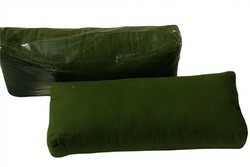 Our company offers Bolster Cushions in pure cotton are great bed accessory. We offer these in all standard sizes suited for various needs. They can be used for various purposes across home and hospitality industries.